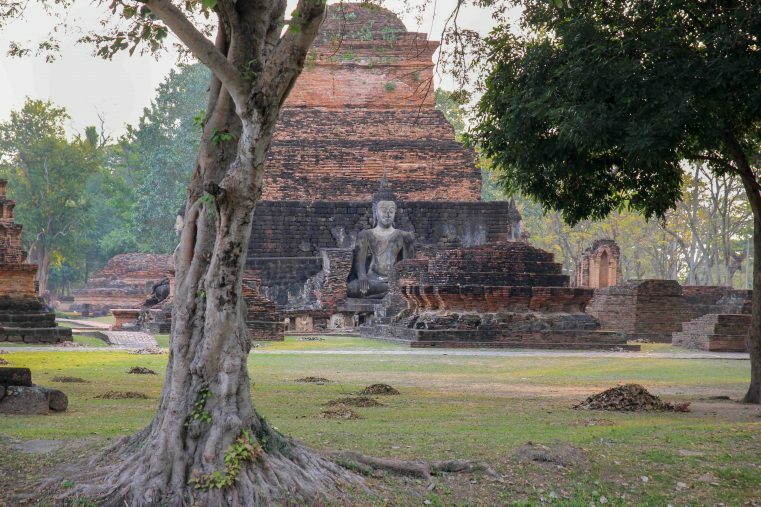 The historic city of Sukhothai is located in the North of Thailand and its Historical Park is undoubtedly one of the country’s most fascinating things to see. This historic park with its ancient ruins, impressive temples and beautiful Buddha statues is even an UNESCO World Heritage Site. 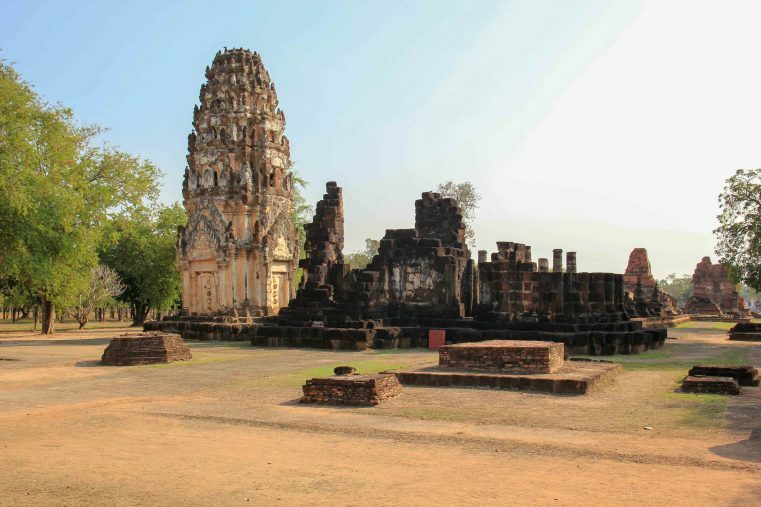 On a tour to Sukhothai, the so called “cradle of the Thai Nation,” you’ll be stepping inside the path of the Thai and Khmer. So you will have the opportunity to dive deep into the country’s impressive history. No matter if by foot or on a leisurely bike tour, there are many interesting attractions which are waiting for you to be discovered! In this blog post we will show you the most beautiful attractions of Sukhothai and what are the best places to visit. 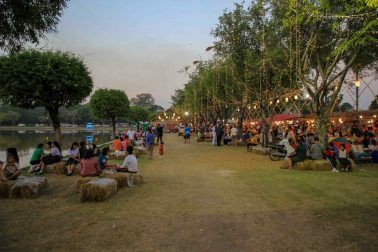 In addition, there are plenty of helpful tips and information about accommodation, how many days you should plan and how to get to Sukhothai. 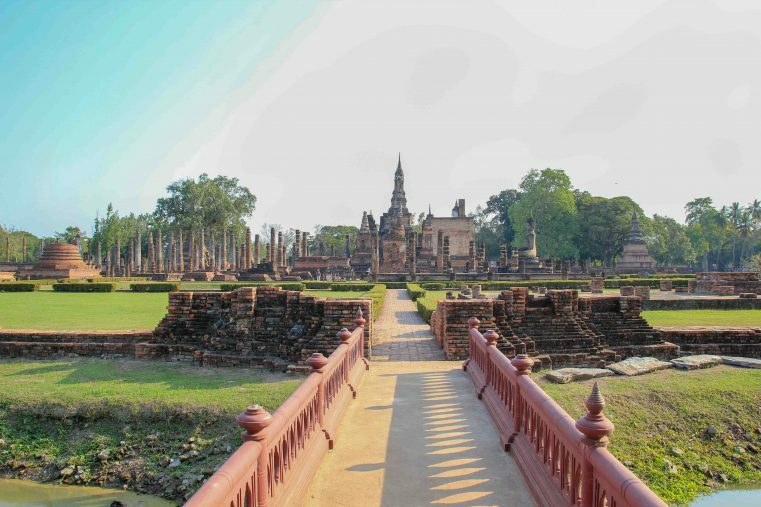 The main attraction of Old Sukhothai is the Historical Park, which dates back to the ancient time of kings. There is a variety of impressive temples to discover! Most of the sights are located between several lakes and ponds so the whole ambience in the park is really idyllic. The listed attractions below are all located in the Central Zone, which can easily be visited by walk or bicycle. 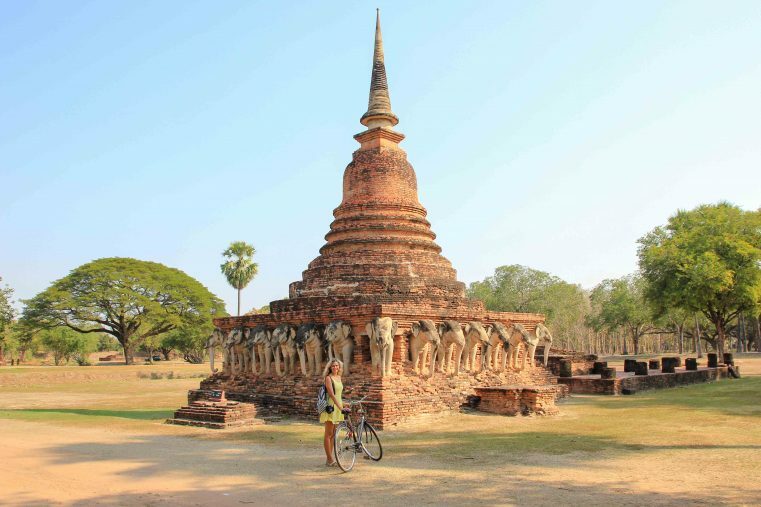 By the way, exploring Sukhothai by bike is one of the best things to do in Sukhothai. Around the area of this Heritage Park are 2 more outer zones, but later more about that. Tip: You will get a free map at the park entrance! The Wat Mahathat is the most important temple in Sukhothai and at the same time the most beautiful! Built between 1292 and 1347, this impressive Buddhist temple complex is also known as the Temple of the Great Relic. In its best period, the temple complex comprised 200 chedis. Tip: Best time to visit this breath-taking attraction is either early in the morning at sunrise or at sunset. Then you have this grandiose ambience completely for you alone and can shoot incredibly beautiful pictures! Wat Tra Phang Ngoen is also located inside Sukhothai Historical Park and is one of the smaller temples of the Central Zone. The atmosphere with the lake is really impressive and the mood, especially in the morning, is uniquely beautiful. Located only a few hundred meters west of Wath Mahathat the Wat Traphang is also worth a visit. 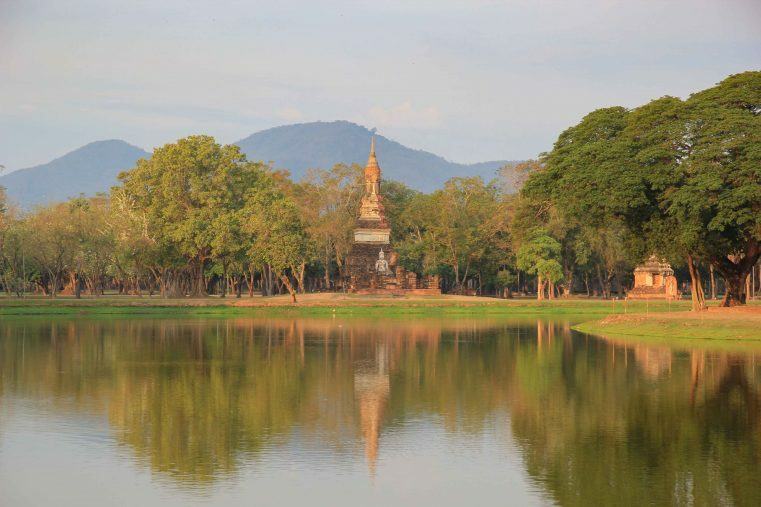 The Wat Sa Si is located in close proximity to the Ramkhamhaeng Monument and impresses with its beautiful location in the middle of the “Silver Lake”. It is one of the most beautiful temples in Sukhothai and we were thrilled! On a walk over the small bridge of the temple ruins, you can admire a fantastically beautiful Buddha statue and the ancient temple ruins. Not far from the Historical Park you should also visit the ancient ruins and temples outside the old city walls. 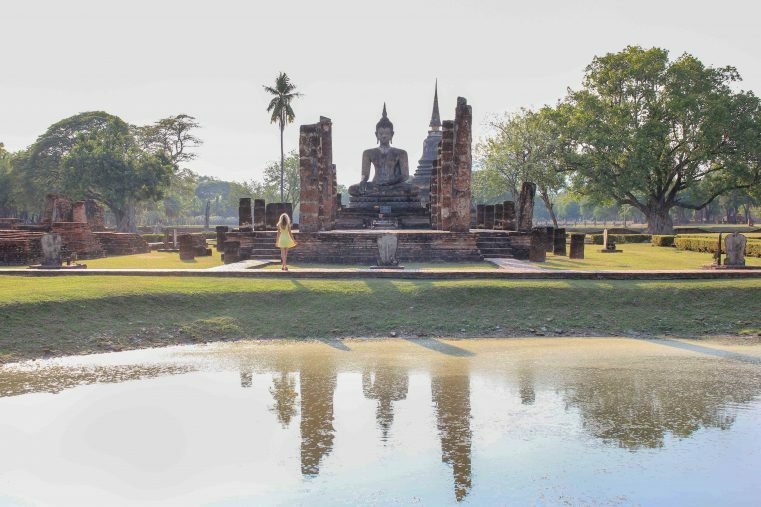 They are a real highlight of Sukhothai and a visit is highly recommended. These temples can be easily visited by bike or scooter. The outer areas surrounding the historic park are divided into the north and west zone where visitors have to extra admission. 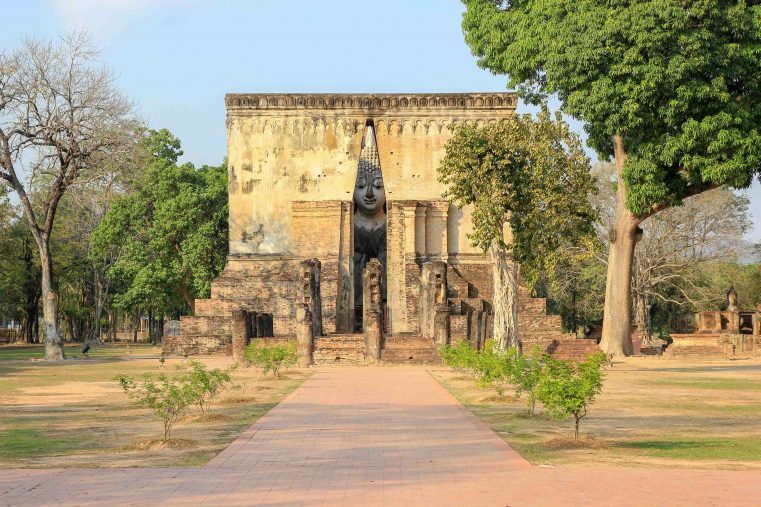 Wat Si Chum is one of the top highlights of Sukhothai and undoubtedly the area’s top attraction. Actually, some of the best photos and painting of Thailand are taken/made at this amazingly beautiful temple. A huge Buddha peeks through a seemingly narrow opening and we were amazed by this exceptional temple. Tip: If you are a photographer or you just love taking photos, you better visit Wat Si Chum in the morning, later the light fades too much. Also worth a visit is Wat Sorasak, a temple ruin from the 14th century. The chedi is held in “Sukhothai style” has been restored and especially beautiful are the elephants that surround the pedestal. 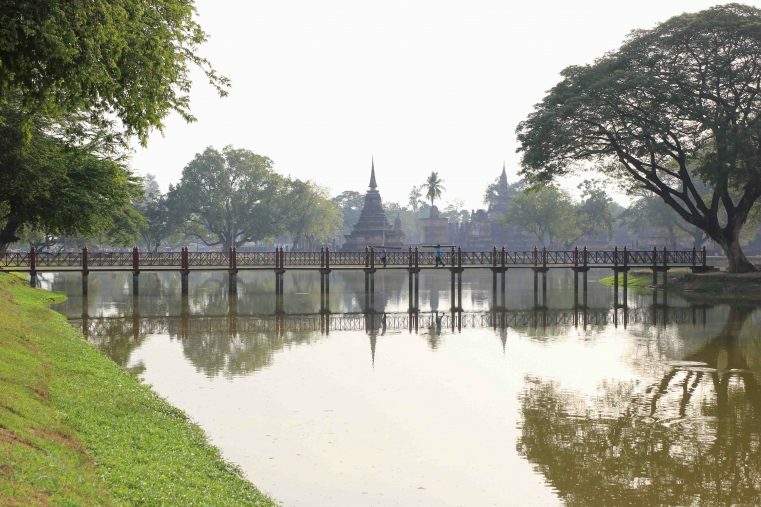 About half a kilometre from the Central Zone is Wat Phra Phai Luang, the Temple of the Great Wind. The heart of these temples are the 3 Khmer style prangs. Also, this attraction is worth seeing and a visit is very recommended. Many accommodations and agencies around the park offer bicycles and scooters for rent. 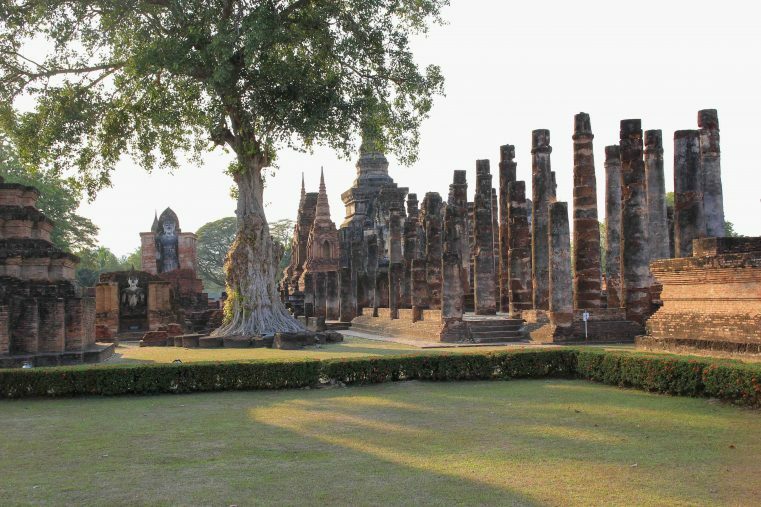 If you want to learn more about Sukhothai and the history, the meaning of statues and temples, you should definitely join a guided tour! Here are some great providers for guided Bike Tours. 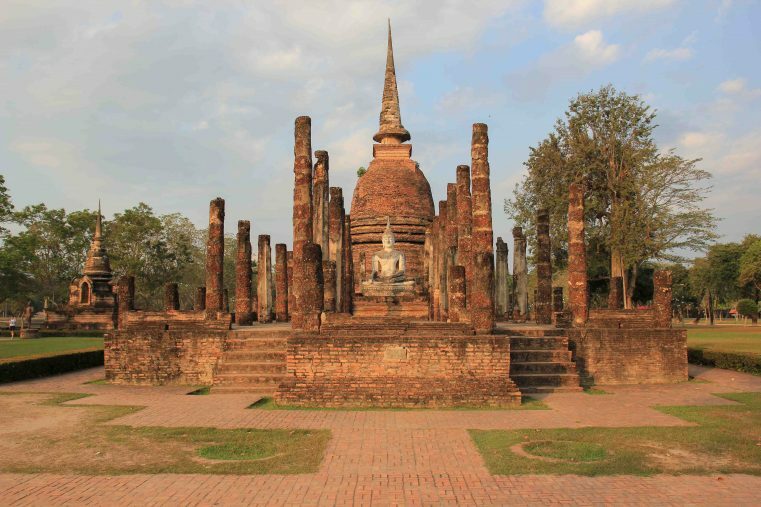 Sukhothai, often referred to as the “cradle of Thailand”, was founded in the early 13th century and was the first capital of the Siamese kingdom. 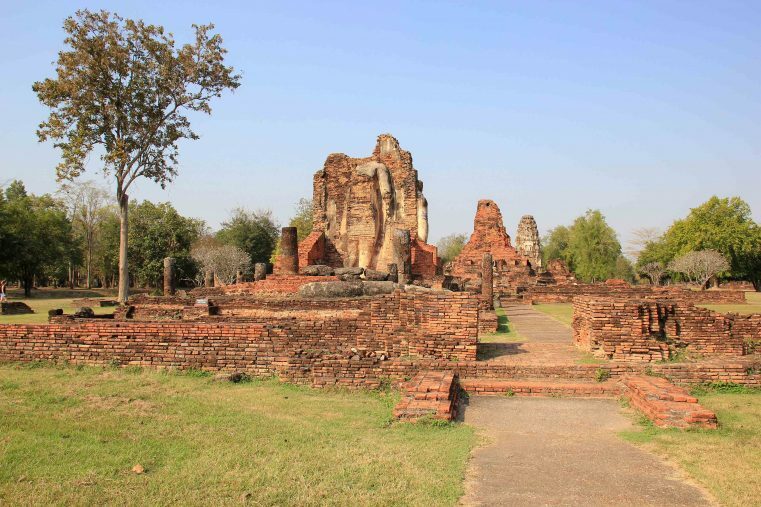 The remains can still be visited today in the old town of Sukhothai. 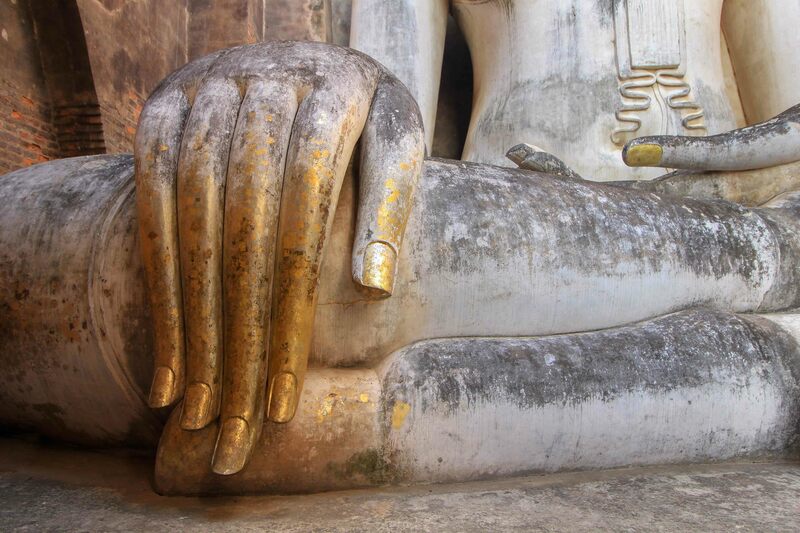 Under King Ramkhanghaeng, Sukhothai flourished and the famous Sukhothai style was created. Still you have the chance to admire the architecture and ancient temples in the Historical Park. Here you will find the ruins of Buddhist temples, Hindu shrines, ancient trenches and pretty ornamental oaks of that time. 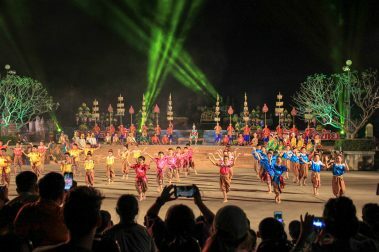 Especially recommended is the visit of Sukhothai during one of the many cultural events and festivals. These include King Ramkhamhaeng’s Great Memorial Fair in January and the Sukhothai Loi Krathong and Candle Festival in November. During that time, the park hosts a huge night market, a great evening program and fireworks. Also, the temples are illuminated, and the park is open until late night. 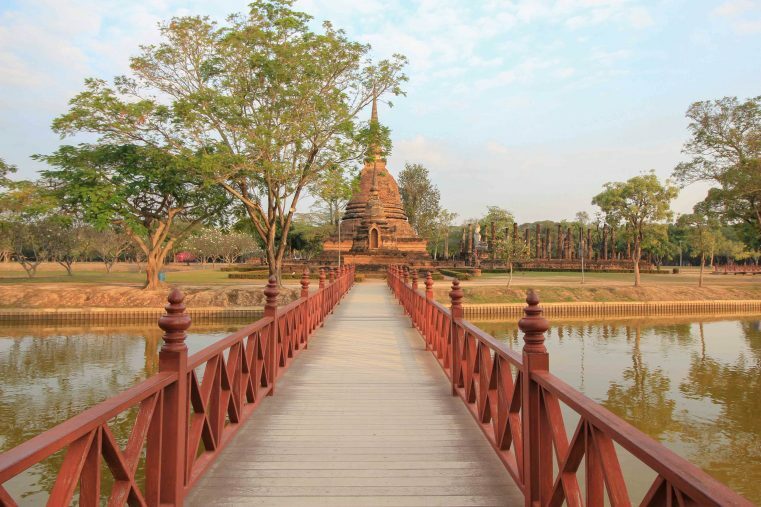 Sukhothai Park is open daily from 6:00 am to 6:00 pm. The entire area is divided into several zones. The ticket to the Central Zone (Historical Park) costs 200 Baht per person, West Zone and North Zone cost 100, – Baht per person. Tip: keep the ticket, it is valid the whole day and multiple access is possible. Directly across from the Historical Park a night market takes places every day. There are also plenty of restaurants and a 7-11 along the main street. To get there by train: Sukhothai is not connected to the Thai train network. If you still want to get there by train from Bangkok or Chiang Mai, you have to get off at Phitsanulok. Take the tuk-tuk to the bus station (60 baht). From here you will have to continue by bus to New Sukhothai Bus station (1 hour, 39, – Baht). From New Sukhothai to the Historical Park in Old Sukhothai with the Songthaew. Or, more convenient by taxi from Phitsanulok Station to Sukhothai (Old Town) for around 800 baht. 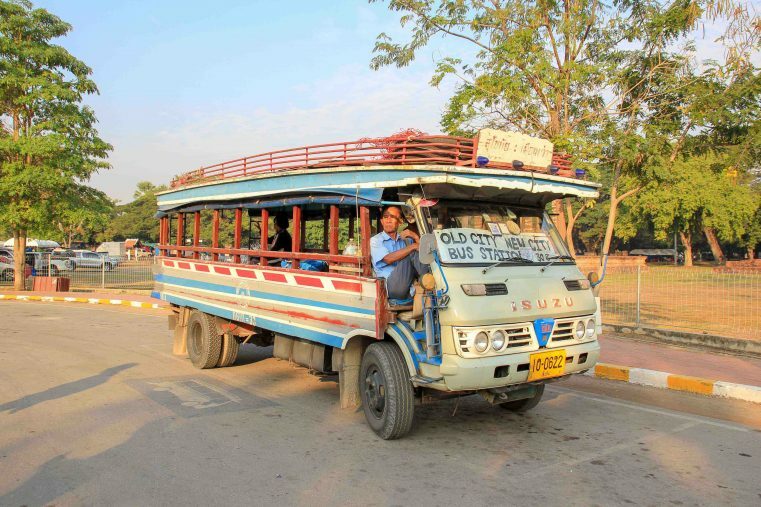 Getting there by bus: From Bangkok to Sukhothai, depending on traffic and stops, it takes around 8 hours. Most buses start from the Mo Chit Terminal in Bangkok. If you are traveling from Chiang Mai to Sukhothai, the journey takes about 6 hours. 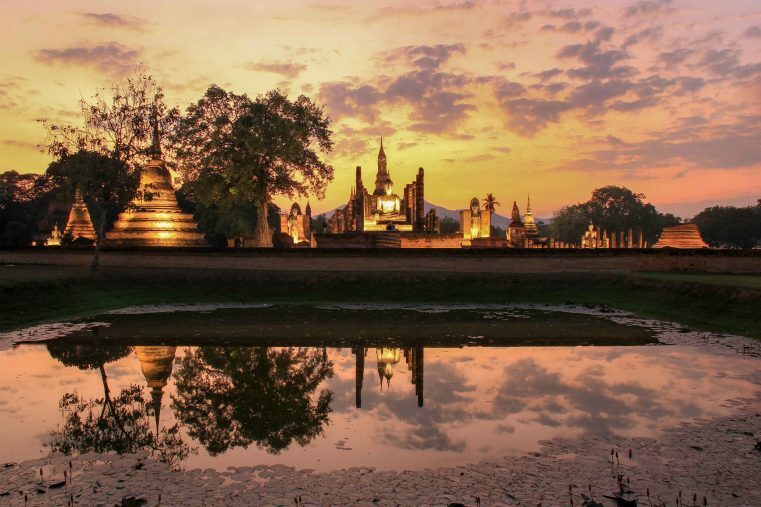 Tours from Bangkok: Discover the treasures of Northern Thailand including Ayyuthaya, Sukhothai, Chiang Mai, Chiang Rai on a 6-days bus tour from Bangkok to Chiang Mai! Click here for the offers. There are many hotels and accommodations in Sukhothai-New City as well as in Old Sukhothai. Since Sukhothai city is about 12 kilometres away, we recommend you book accommodation in the Old Sukhothai, in the vicinity of the historic park. You will save time and money and you can visit the park already early in the morning! 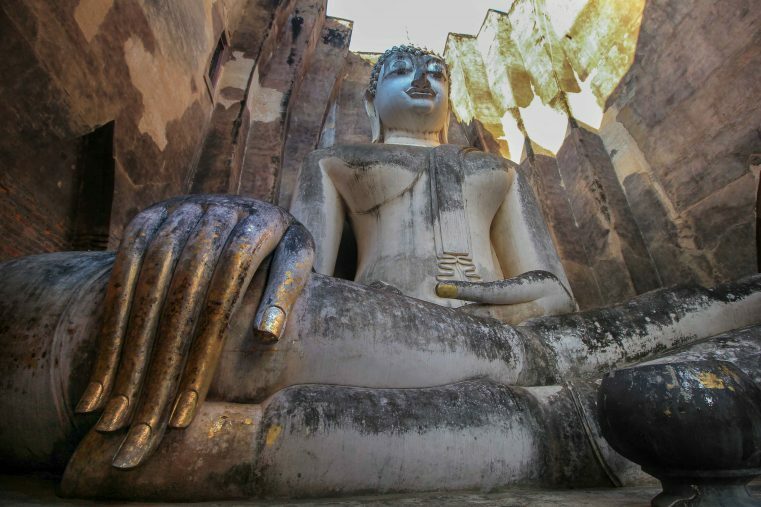 If you want to get the most of your time, we recommend staying at least 2 days in Sukhothai. Day one for the Historical Park and day two for exploring the attractions around. Sriwilai Sukhothai: The beautiful Sriwalai Hotel has a large pool and a wonderful view to rice paddy fields. 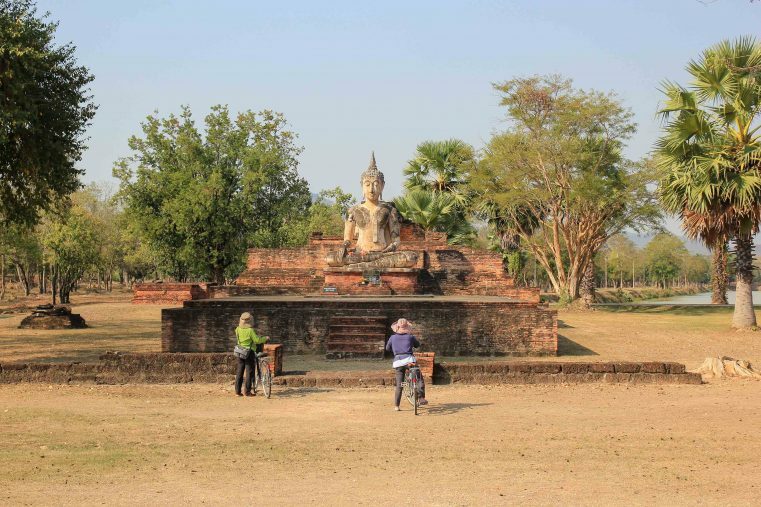 Also good is the proximity to the Historical Park Sukothai, which is easily accessible by bike. Pottery Street House: As a budget alternative, we can recommend the Pottery Street House. It is even more central to the history park, in a side street and is therefore very quiet, but still very easy to reach.